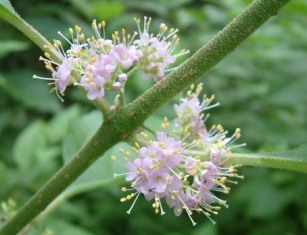 American beautyberry is a native of America. Its plants occur naturally from Maryland, south to Florida, and southwesterly into Tennessee, Arkansas, and Texas. It also grows in Mexico, Bermuda, the Bahamas and Cuba. It inhabits relatively open, well drained, rich woodlands and dry hammocks. A deciduous shrub, 1 to 2.5 m. high, with slender, spreading branches. Leaves, opposite on 12 mm to 25 mm long stalks; oval to elliptic, pointed at both ends, finely toothed; 7 to 6 15 cm long, slightly rough. Flowers lavender or bluish, small, 4-lobed, in axillary clusters Spring. Fruit light-purple, round, 3 mm wide, thin-skinned, with white, moist mealy pulp; borne in showy, compact axillary clusters surrounding the stems. Seeds 3 or 4, minute, bony and yellow. 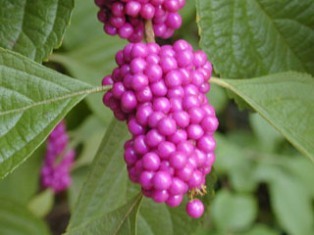 American beautyberry fruits are edible. However, these should be eaten in small quantities as after a few minutes they cause dryness in mouth and also give a feeling of astringency. In fact, the best way is to pick and eat a single fruit one by one. 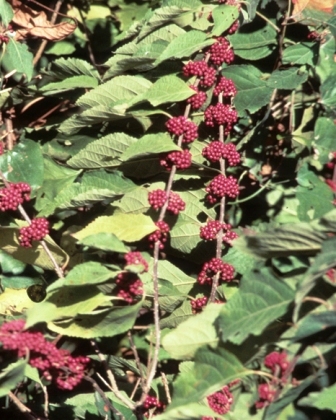 American beauty-berry is an outstanding shrub. The fruits besides being edible are also showy and attractive. So this plant is very suitable for planting in gardens. This is very adaptable plant and can even grow on poor soils. It is also fairly drought resistant. However, if it is to be grown as a garden shrub, then it should be planted on well drained soils. 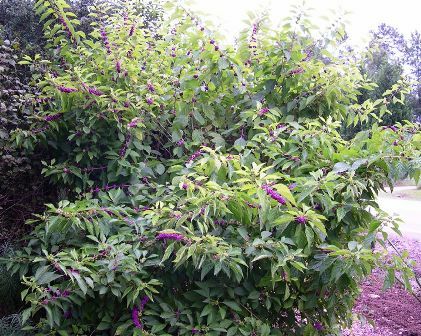 New plants of American Beautyberry can be raised from seed. The varieties should, however, be propagated asexually and bthis can be done by using semi-hardwood cuttings. Varieties: Some named varieties are also offered for sale by some nurseries. One of such varieties Lacta has white fruits.